White wine pairing tips for cheesy, saucey foods. I live in Florence and summer has indeed arrived. Except for today. Which is why I am not a sweaty mess and why I can even stand to be near my computer. It’s so funny to see my friends in Seattle through the social media webs wearing light spring jackets and here I am pushing the envelope basically trying to see how much I can get away with not wearing and pondering how sheer I can really get away with because I feel like I am going to die if I wear anything other than a gel pack of ice. I am exaggerating, after all I could be in Cairo where it’s like 110 degrees. Anyways, I digress as usual. I am very weary of red wine in the warmer months in Florence, not only because to me red wine says cozy sweater and fireplace recounting the days I spent backpacking through Europe saving baby kittens from olive trees, but because most shop keepers are infuriatingly aloof about how they store their wine on the shelves. A wine shelf near the door is a horrible idea. And unless it is a super market, or a very smartly designed shop (that is not ever in direct sunlight) or has the luxury to invest in air-conditioning I don’t trust poorly stored red wine to be anything but vinegar or acidic grape juice at best. I wanted to stick to a white wine from Southern Italy because I am obsessed with gastronomic identity, meaning to pair local wines with the local cuisine. 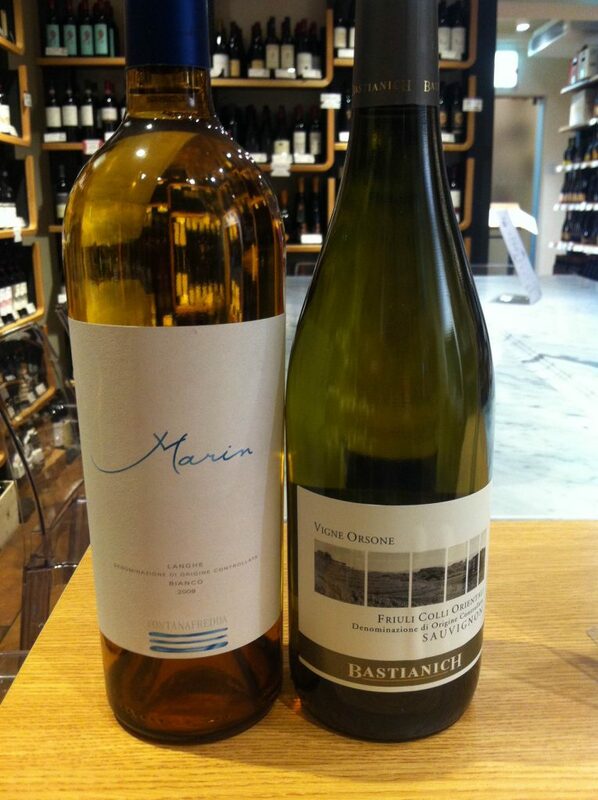 In theory, an elegant white wine from the Langhe (in the Northern, Slow Food capital region Piedmont) such as Marin by Fontanafredda could have sufficed just as easily as a rich, aromatic yet balanced Sauvignon by Bastianich from Friuli. But I wanted to go down south where the dish originates. You should still try these with something cheesy or creamy like risotto, the traditional Piemontese vitello tonnato (which is boiled veal in tuna mayonnaise) or anything with seafood, of course. COS Rami Sicilian White (as early as 2012) This is a very unconventional winery which specializes in local, indigenous grape varieties and abides by biodynamic production methods. 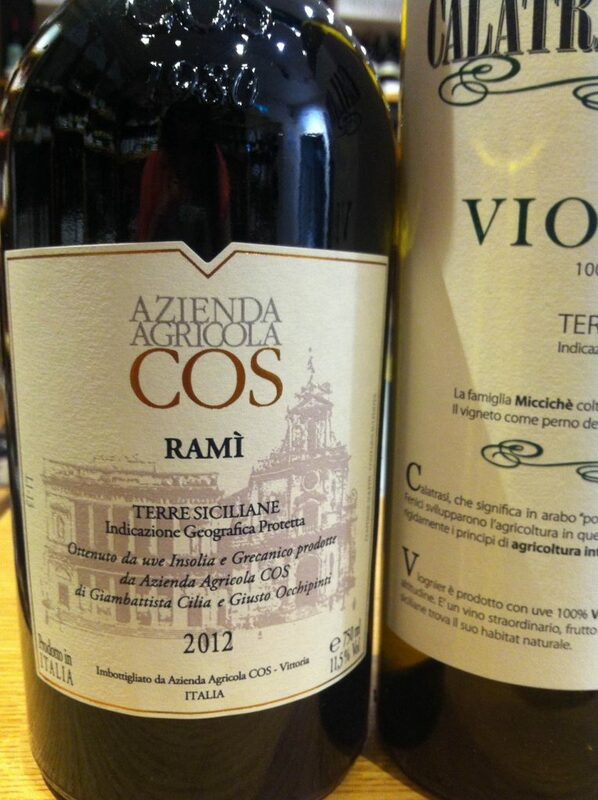 The particular grapes showcased in COS’s Rami are Inzolia and Grecanico. 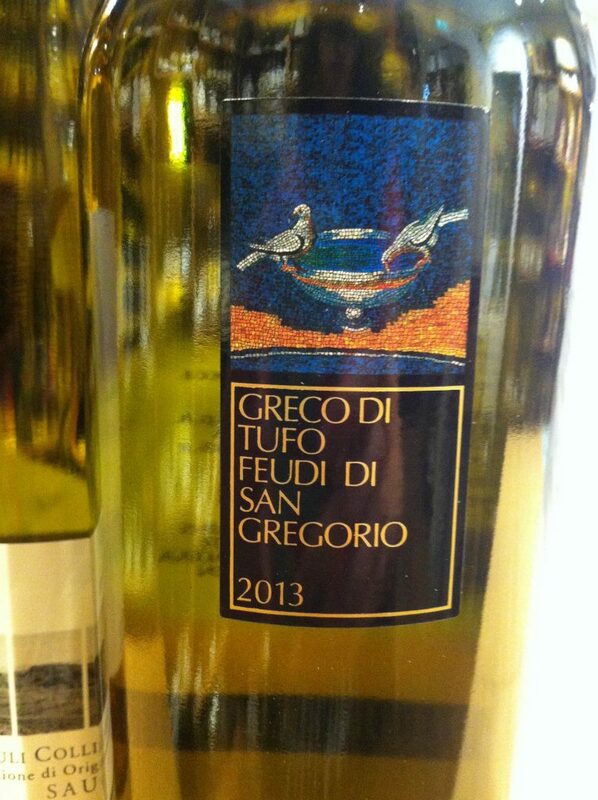 A Greco di Tufo from the famous Feudi di San Gregorio in Campania. But what I ended up choosing was a Sicilian Viognier by Calatrasi & Miccichè. This would be good also with a chicken dish in a cream sauce or a creamy mushroom risotto- perhaps not exactly Sicilian foods but just to give you an idea what Viognier could also match well with. I picked this because Viognier tends to be a richer white wine, what I like to call a greasy wine which give a nice full mouth watering start and long finish but not too fruity or aromatic, with just a tinge of petrol on the nose which for me is also why I call it greasy. This was a great wine pair for a saucy, creamy ricotta filled Eggplant Parmigiana which I proudly made, by grilling (not frying) the eggplant, and whipping up the tomato sauce from scratch with heirloom umami rich tomatoes, garlic, herby olive oil from the most recent fall’s pressing and fresh basil. 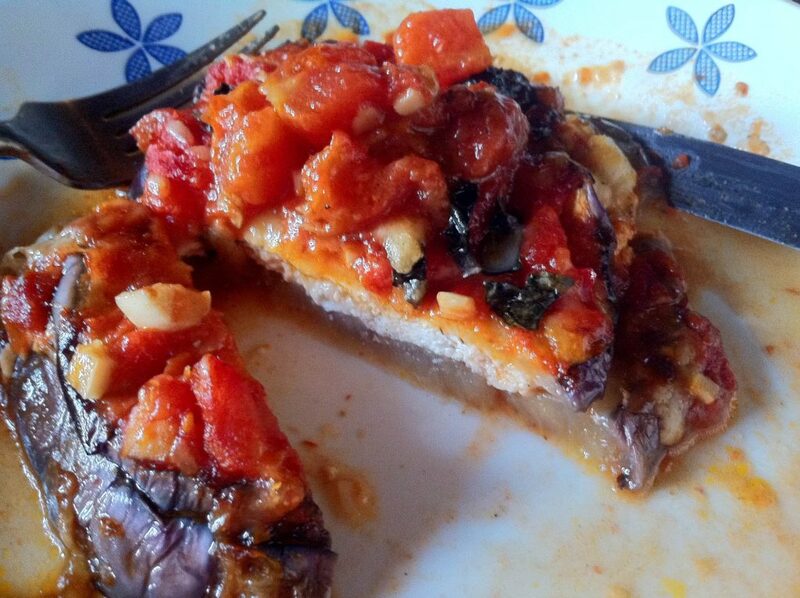 I’m hungry just looking at this ricotta eggplant burger looking thing. In my posts regarding food and wine pairing, I don’t go into the tasting notes too much because I just want readers to know what’s good in my opinion and to find out for themselves. Wine is all about opinion. And these are my suggestions that you can take or leave. This is my blog and this is what I think.